Philly Bird Nerd : Wanna Go To Canada for the Weekend? Why Not! You may remember that before Christmas, Todd and I took a few days off of work and headed to Algonquin Park in Ontario. We saw some really cool birds and Pine Martens. What I didn't say was that we almost detoured from that trip to chase a MEGA RARE bird in New Brunswick Canada. Mega Rare as in first ever reported. The bird was reported about a week before we were to make the trip to Algonquin. We discussed chasing it but decided to stick with our original plan. Well, it is 2 months later and the rare bird is still in New Brunswick. You know what's coming next right? Oh yeah. We couldn't resist. We added Marty to our crew, rented a minivan and headed up to see the first ever recorded Mistle Thrush in North America. Marty and I left my house at 8:30 PM on Friday night after working a full day. We picked Todd up in NJ at 9:30 and drove all night through New England, Maine, and made it to the border just after sunrise on Saturday morning. We traded time in the back of the van to catch some shuteye which helped us make the overnight haul. By noon, we were on site in Miramichi, New Brunswick in the neighborhood where the bird has made it's winter home since December. 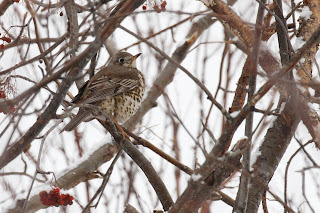 All reports said that the Mistle Thrush was hanging out in the neighborhood eating Mountain Ash berries. It moves between a few yards but has been mainly seen at 512 McKenna Avenue lately so that is where we began our search. 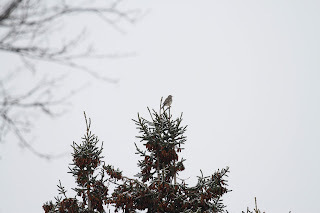 After a few minutes of staring at the Mountain Ash without seeing the bird, we saw something move in the Spruce tree behind it. Yes. The Mistle Thrush was there. 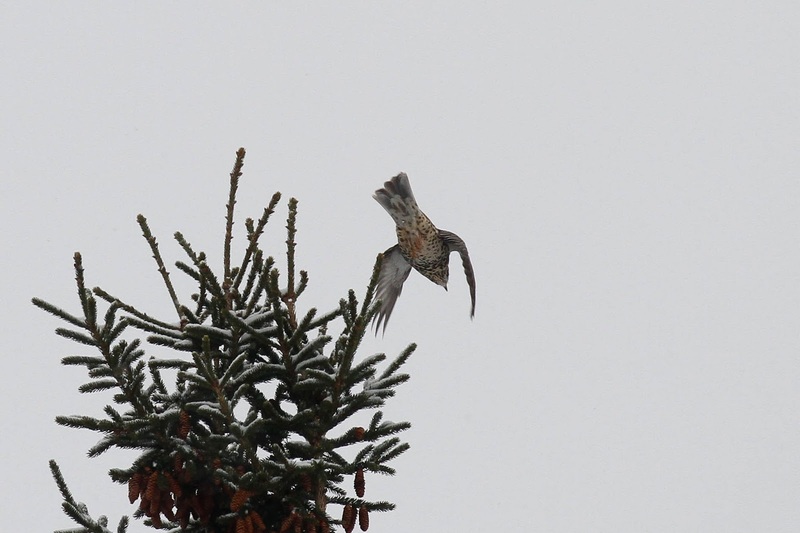 It flew up to the top of the Spruce tree. It sat there for a few minutes where we got to study the field marks that set this bird apart from "our" thrushes. The main field marks are the size and the spotted breast. And then, it had enough and flew to another part of the neighborhood. I caught a photo of the bird just as it took off. Interesting to see the spots go all the way to the tail. We searched the neighborhood for the bird. I guess the residents are used to having cars with weird license plates cruising the neighborhood by now. We found the location where the bird was first reported and saw some other birds but no thrush so we drove back to where we saw it and waited. It only took a few minutes for the bird to return. Todd spotted it back in it's favorite hiding place - the Spruce tree. Then, it jumped into the Mountain Ash to chow down on some berries. 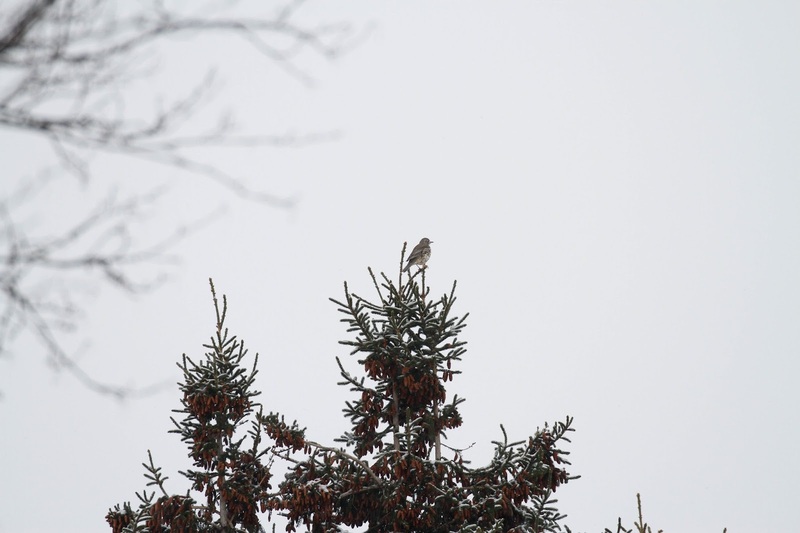 Photographing this bird is difficult due to the mass of branches, overcast sky and light snow. This is probably the best photo that I could manage and only after maneuvering the van a few feet at a time to get a clear view. I cropped the photo so that it shows one of the berry clumps that is keeping this bird fat and happy in Canada. True Fact - this is NOT a life bird for me. I saw a few of these in England where the bird is supposed to be. 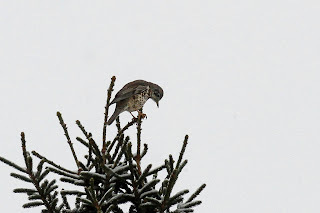 Click here to read about that trip and see another photo of the Mistle Thrush. 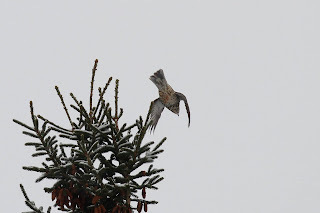 While not a lifer, this sighting does add another bird to my ABA list - now at 625! A bonus for the trip is that Marty's sister lives in Bangor Maine and invited us to stay with her overnight. Boy, what a respite. She had pizza, beer, hospitality and beds all ready for us when we arrived at 7:30 PM on Saturday night. That was 23 hours after leaving my house! I was asleep before my head hit the pillow.